China's diplomacy has turned a brand-new page in 2013 after its new leadership stepped into the global arena, vowing to better integrate with the world while keeping in mind "the Chinese dream." 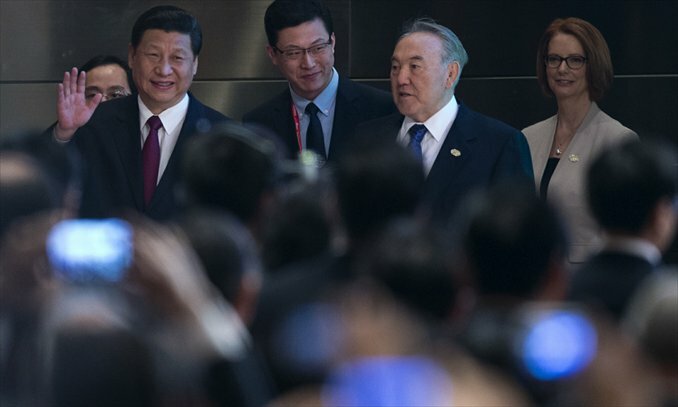 Chinese leaders have left their footprints in dozens of countries throughout Asia, Africa, Europe, Latin America and North America and welcomed the visits of more than 50 state leaders to Beijing in 2013. 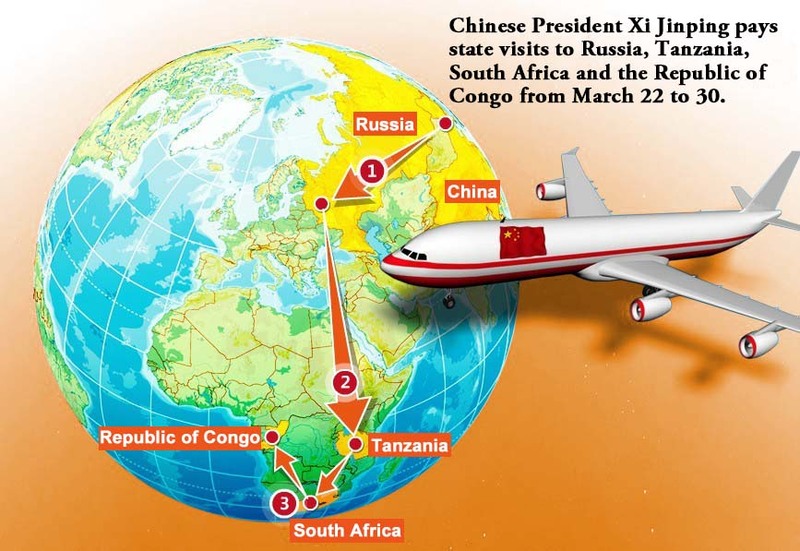 Chinese President Xi Jinping paid state visits to Russia, Tanzania, South Africa and the Republic of Congo from March 22 to 30. Chinese President Xi Jinping delivered a keynote speech at the opening plenary of the Boao Forum for Asia Annual Conference 2013 on April 7 in Boao in South China's Hainan Province. 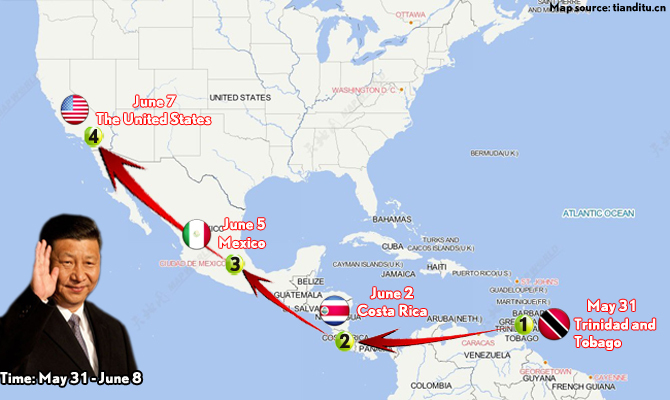 Chinese President Xi Jinping paid state visits to Trinidad and Tobago, Costa Rica and Mexico from May 31 to June 6, and met with US President Barack Obama in the United States on June 7-8. 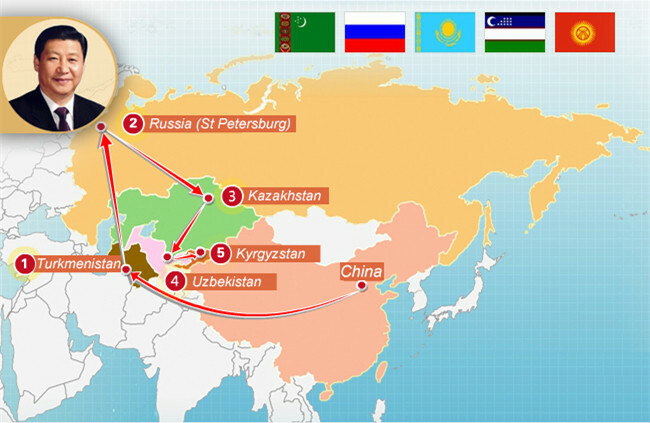 Chinese President Xi Jinping paid state visits to Turkmenistan, Kazakhstan, Uzbekistan and Kyrgyzstan from September 3 to 13. Xi attended the eighth Leaders' Summit of the Group of Twenty (G20) in St Petersburg, Russia on September 5 and 6, and he also attended the 13th Meeting of the Council of Heads of Member States of SCO in Bishkek, capital of Kyrgyzstan, on September 13. 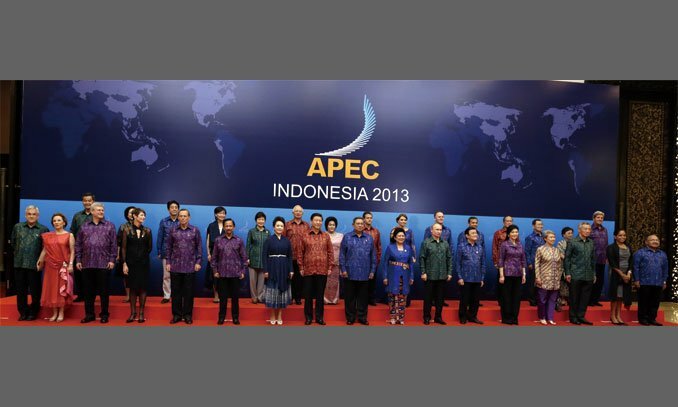 Xi Jinping attended his first APEC summit and paid state visits to Indonesia and Malaysia from October 2 to 8. 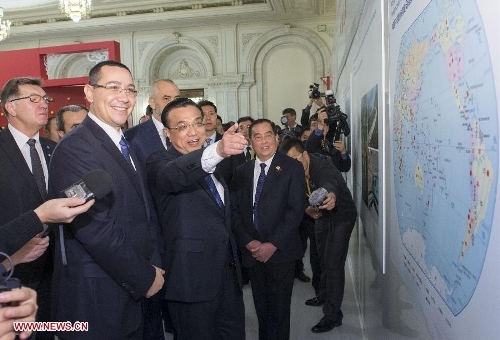 Chinese Premier Li Keqiang paid official visits to four nations from May 19 to 27. 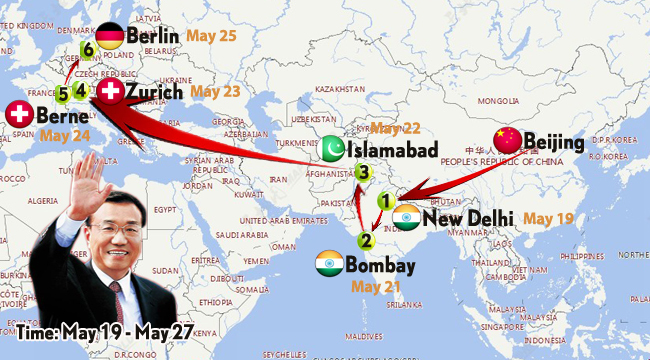 Li's visits to India, Pakistan, Switzerland and Germany were at the invitation of Indian Prime Minister Manmohan Singh, the Pakistani government, Swiss President Ueli Maurer and German Chancellor Angela Merkel, respectively. 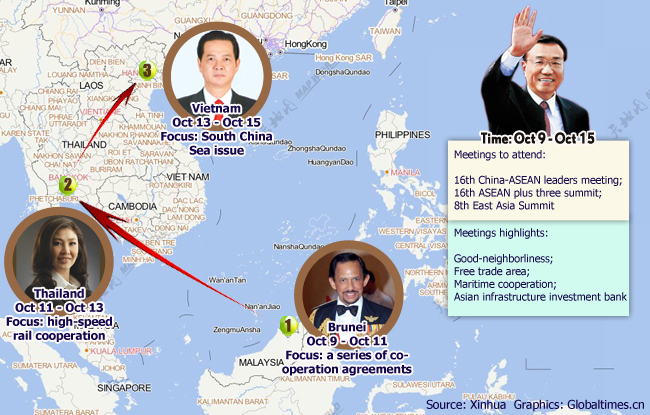 Chinese Premier Li Keqiang paid official visits to Brunei, Vietnam and Thailands from October 9 to 15 and attended 16th China-ASEAN leaders meeting, 16th ASEAN plus three summit, and 8th East Asia Summit. Premier Li Keqiang of the State Council attended the China-Central and Eastern European Countries Summit in Romania, paid an official visit to Romania and attended the 12th Prime Ministers' Meeting of the Shanghai Cooperation Organization (SCO) Member States in Uzbekistan from November 25 to 29. The Sino-Russian relationship has been upgraded to a new phase. The Sino-US relationship has entered an era of building a new type of relationship between big countries. A series of major strategies have been proposed by Chinese leaders in developing China's good neighbor relations. China is becoming a more responsible power. China enhances cooperation with other developing big powers. China's diplomacy commits to pursuing national interests. ●China will further build a framework for its relationships and deepen strategic mutual trust and integration of interests with big powers. ●China will increase cooperation with US and expand cooperation with Russia in various fields as well as coordinate development strategies with the European Union and enhance cooperation with other developing big powers. ●China should enhance economic diplomacy to serve the far-reaching domestic reform. ●China will enjoy home advantage in hosting two major diplomatic events including the Conference on Interaction and Confidence-Building Measures in Asia and the APEC summit to strengthen regional security cooperation and promote economic cooperation. The Chinese government has taken a more central role this year. For example, "China has played an important role in solving Syria's chemical weapon crisis and Iran's nuclear crisis, indicating the nation is becoming a more responsible power." Seeking a deliberate balance between an increasingly confident China and a not so confident US, the US side is attaching more importance to bilateral relations in Obama's second term. The most difficult part of building a new type of relations between China and the US is to build mutual strategic trust between the two. Beijing has shifted its strategic focus from maintaining good relations with large economies to neighboring countries. Instead of the US and European countries, China's new leadership picked neighboring countries as the destination for their first visit. The Chinese dream, which conveys China's pursuit of peaceful development instead of hegemony, will build a positive peace-seeking and modest international image for China. Public diplomacy propagating the Chinese dream will influence China (and the world) profoundly in the future. China's diplomacy in 2013 showed the switching of attitudes toward global governance. China is gradually gaining a leadership role in managing international affairs. However, how to balance domestic interests and international ones will be a critical task.